While I do not intend to bore you with 35 days of decluttering photos, I thought I would devote a post to my #HolidayDeclutterStreak kickoff. Before I started this challenge I spent some time with my Passion Planner and made a list of 35 spots in my home that I can declutter. I tried to pick smaller areas, since I will be doing this mostly in the evenings after work. There are a couple of larger areas as well, but I have tried to avoid any rabbit holes. The first target that I selected was the cabinet about my oven. 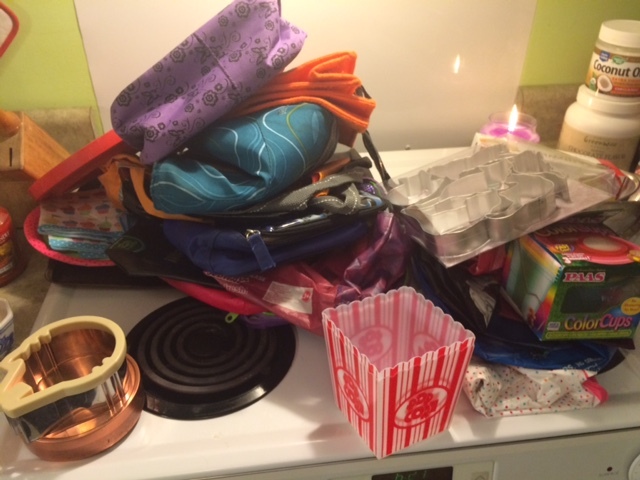 It was stuffed full of lunch bags that no one uses any more, and other kitchen detritus, to the point that I can’t get the things that I do use in and out without stuff falling on my head. Furthermore, since it is above eye-level, no one can really see what is in there (or bothers to clean it out). The first thing that I did was draft the services of my daughter, who happened to be wandering through the kitchen. We got out the step ladder, and I removed everything from the cabinet. 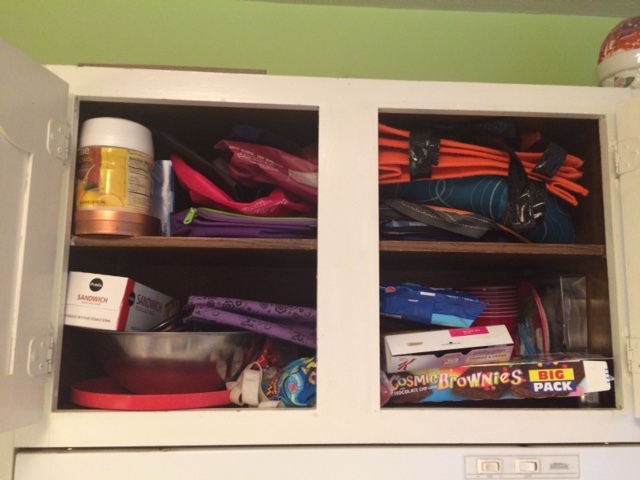 We relocated any foods items to the “food” cabinets, since it is too easy to lose food and have it go bad in this cabinet. Then, I started going through and deciding what to keep. 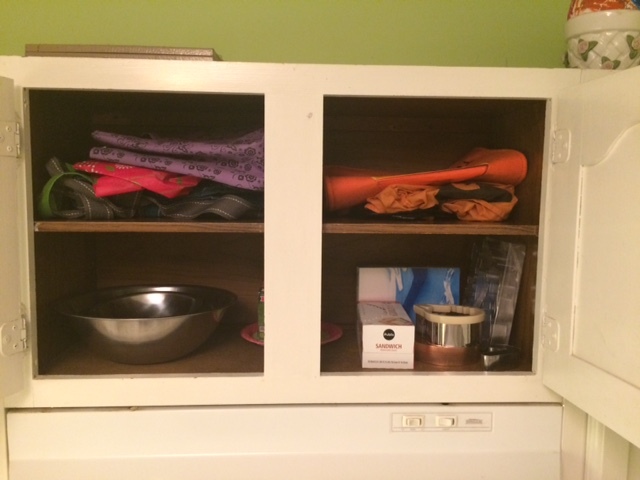 The most helpful declutter tip that I ever heard was select what to keep, not what to get rid off. 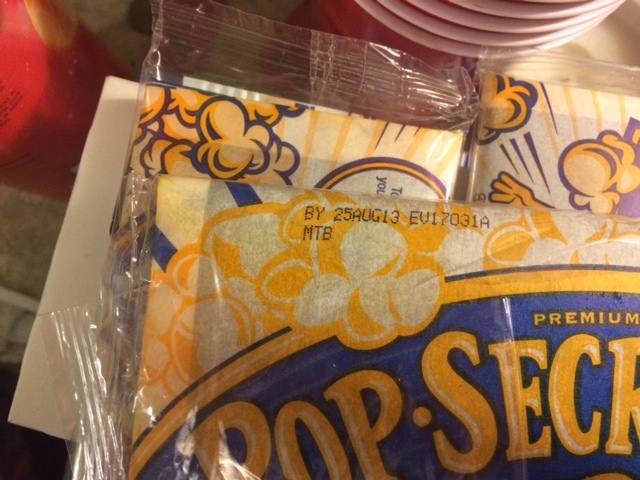 The first thing to go was this popcorn, which had been lost in the back of the cabinet for who knows how long. Check out the expiration date! 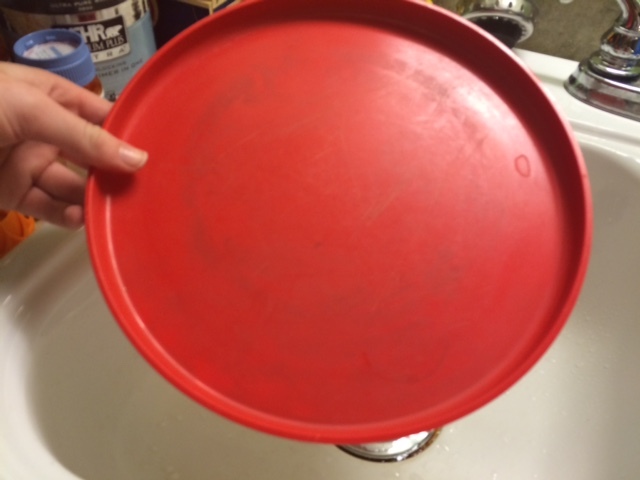 This resin plate has seen lots of service, but it was stained and cracked. I think I had a plant sitting on it at one time, before Fifi ate them all (crazy cat). It was too beat-up to donate, and could not be recycled, so we tossed it. 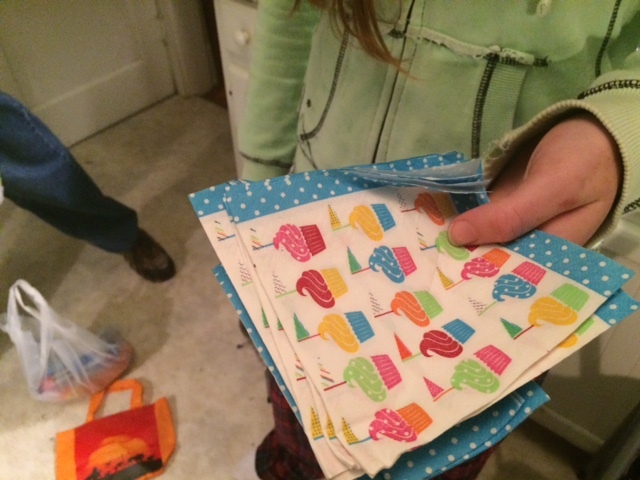 These old birthday napkins went into the “napkin drawer”, where they will finally get used. 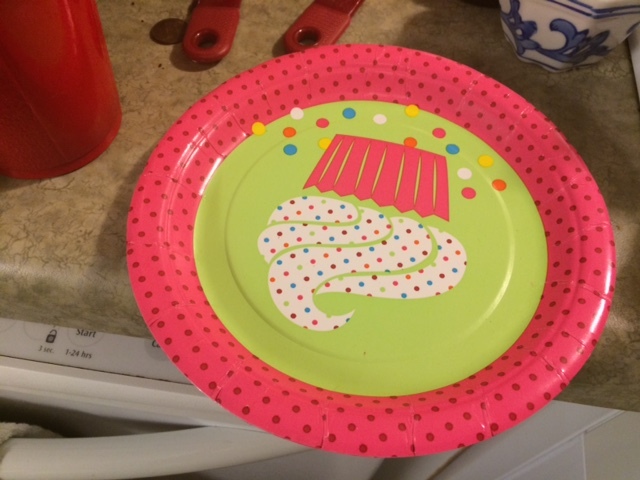 These matching paper birthday plates will be kept, as my daughter uses them for craft projects. 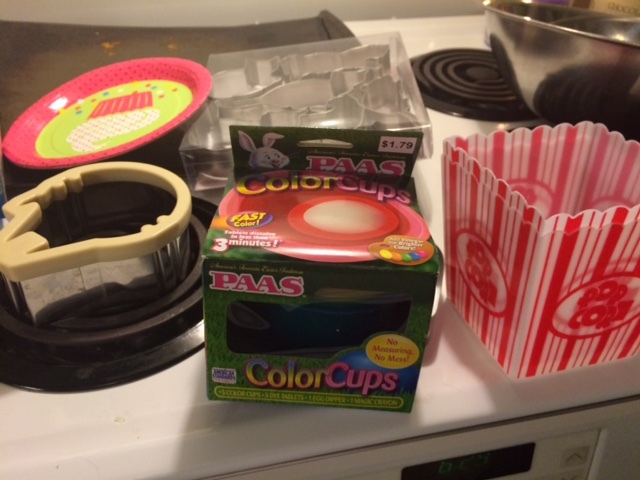 These plastic cups had been stored with balloons(?!) inside them, so they were pretty grotty. They got recycled as did the mostly-broken box for plastic forks, and of course, the balloons (not shown). I have no idea how long these seeds have been up there or even how they got there, but I sincerely doubt that they are still viable. So we tossed them. 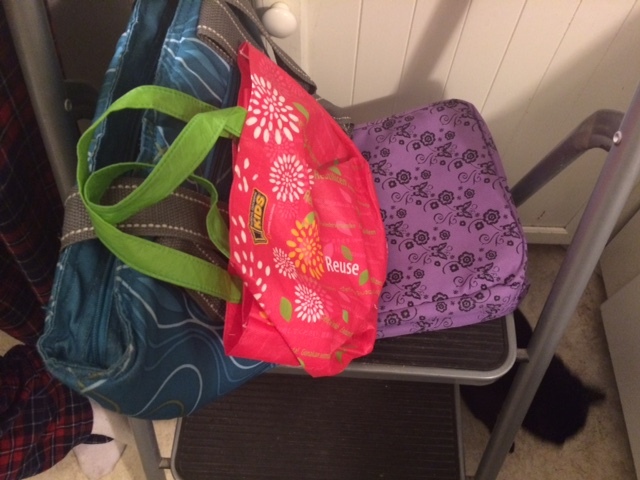 These are the three lunch bags that my daughter chose to keep. 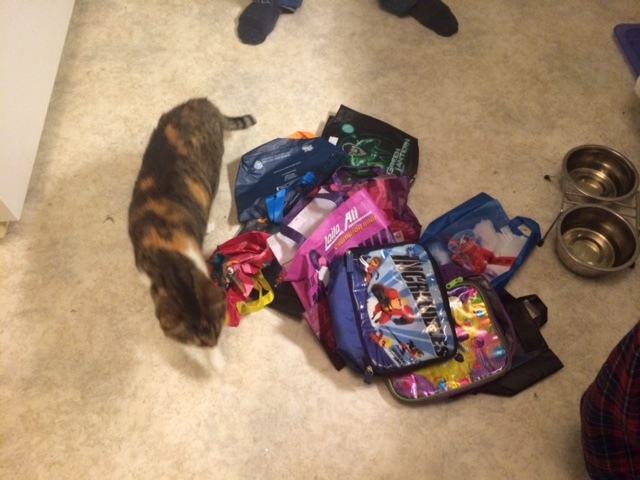 One is one of those thermal bags, one is a regular lunch bag, and one is for when she wants something that she can stuff away after (it’s a Subway kids meal bag). 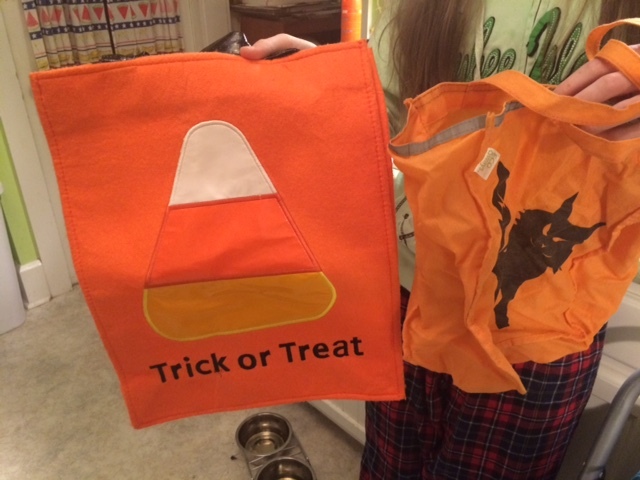 These are two Halloween trick-or-treating totes that we still use. 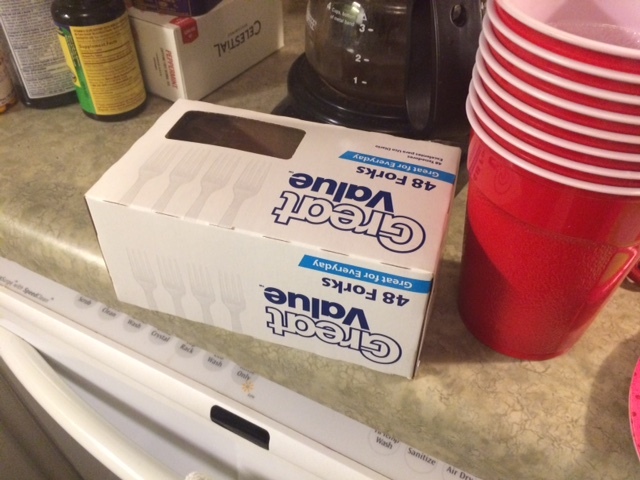 Here is a box of non-broken plastic forks that we kept. 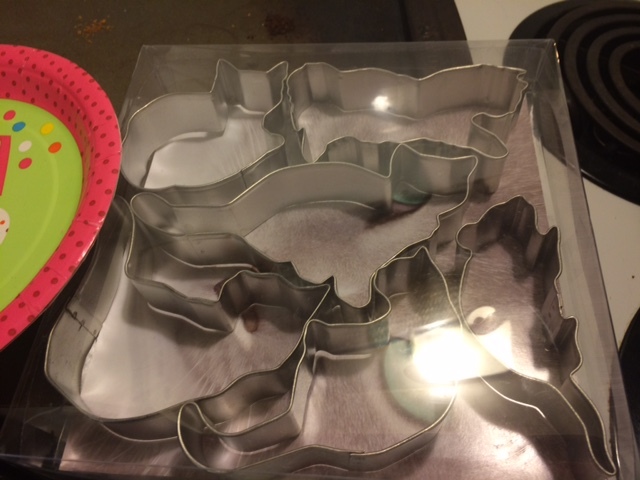 And of course I kept my kitty cat cookie cutters! 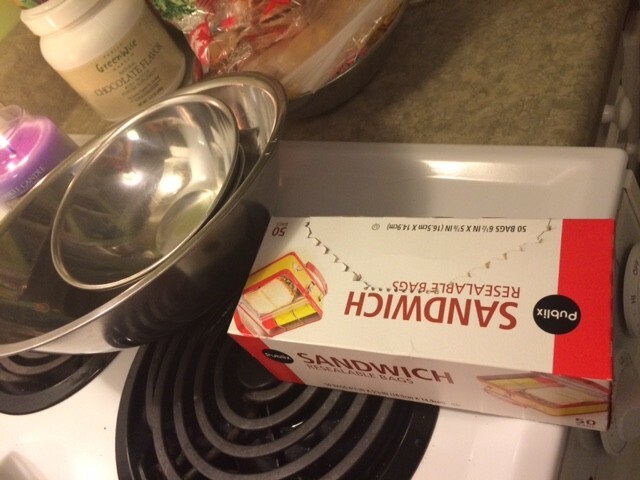 We kept the sandwich bags and the mixing bowls, both of which get used regularly. We relocated these popcorn cups to another cabinet so we could actually find them when needed. We kept this unopened Easter egg dying kit, which we can use next Easter. And of course this Millennium Falcon cookie cutter (there is a C3PO one around somewhere as well). I think Santa will have some Star Wars themed cookies this year. We also kept a little tin of gingerbread man cookie cutters (not shown). 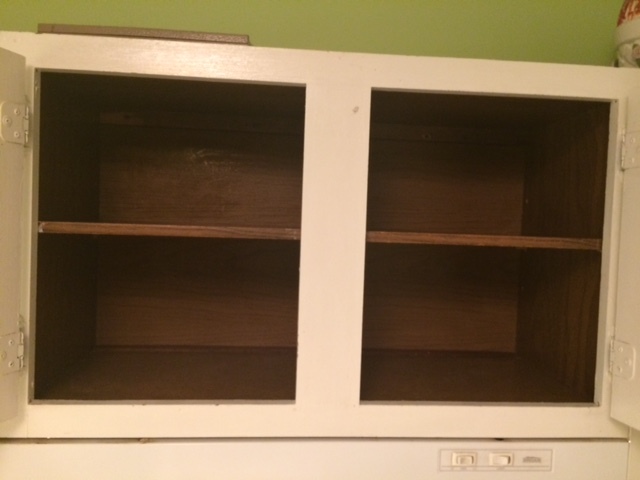 Next I cleaned out the cabinet thoroughly with soap and water and let it dry completely. 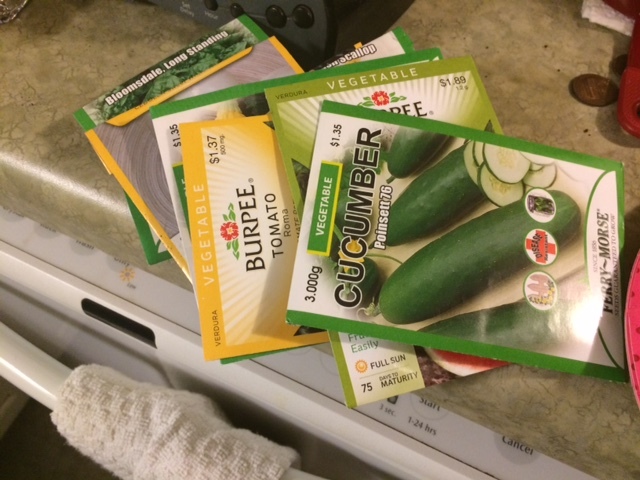 Then I replace the items that were being kept. See how much better it looks? I will be able to get my mixing bowls down without sandwich bags falling on my head, or get a single lunch bag without creating an avalanche of lunch bags. 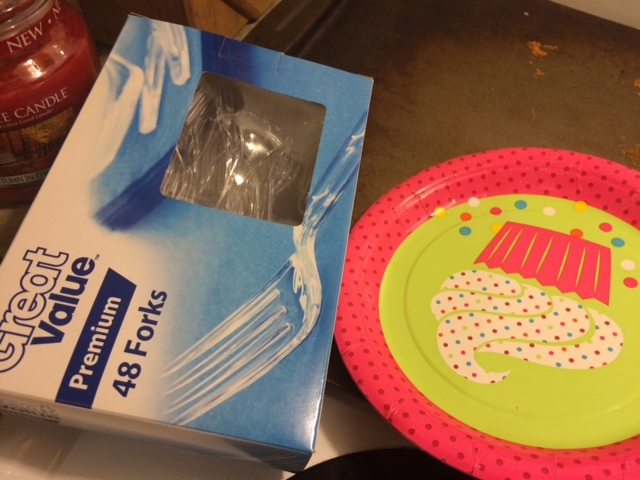 I estimate that we got rid of about 30 items (I refrained from counting the forks and balloons individually). I added 30 checkmarks to my “2015 items in 2015” sheet. Henceforth, I will only do a weekly round-up of the week’s Holiday Declutter Streak actions, but I will post info daily on Twitter @quiltkitty. I challenge any of you who are interested to join me! You can post comments and results here or on Twitter using #HolidayDeclutterStreak. In other news, my #RWRunStreak challenge is proceeding well, and I will be preparing for my Day 3 run shortly. My toe, which I banged against a piece of lumber in the dining room (sigh) while I had pneumonia, has begun to hurt and swell after I run. Don’t know what that it about since it was a month ago that I hurt it, but whatever. It’s not that bad, and my runs are pretty short, so I think it will be OK.
We did not go shopping on Black Friday, as we observe Buy Nothing Day instead. However, I must confess that I did buy something. I purchased a new set of wireless headphones for running. I only ended up buying them yesterday because I have been complaining about my current pair for a while, and keep forgetting to look for new ones. The pair that I have sound great, but they are in-canal earbuds, which not only block out sound while I am running (dangerous), but also make a clomp, clomp, clomp sound while I run to the point where I can’t hear whatever I am listening to. So while I was thinking about it (and no one was using the computer), I spent some time doing some online research and reading reviews, and finally settled on a new Liger pair that were inexpensive but got great reviews. I have rationalized that since these were something that I was planning to purchase anyway, they only partially count as a Black Friday purchase. The Great Coat Closet Remodel Project should get some attention today. Additionally, we are having some issues with our heat pump condenser as well, so you may see a HVAC repair post in the near future! So, exciting!